So I was out installing a new laptop for a client recently, their server infrastructure is very old (they’re still running Server 2003 but about to migrate) and doing the final stage of the deployment I was installing the local printer in the office but got Windows cannot Connect to the Printer (0x0000007e) error every time I tried. I finally stumbled upon an old forum topic regarding HP print driver incompatibilities between 32 server and 64 bit client machines where it was unable to find a particular file. 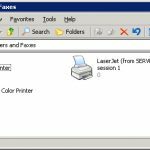 The trick was to delete the following registry key HKEY_LOCAL_MACHINE\SYSTEM\CurrentControlSet\Control\Print\Printers\PrinterNameHere\CopyFiles\BIDI replacing PrinterNameHere with the name of your printer. This then allowed me to connect to the printer correctly on the 64 bit client without any errors.